One of the most unique and endearing qualities of parrots is their ability to talk. These birds ability to mimic human speech is unrivaled among other types of pets. 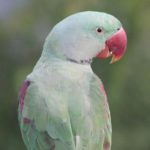 Let’s examine how can parrots talk and engage in such behavior and why these amazing creatures can accomplish this seemingly incredible feat. 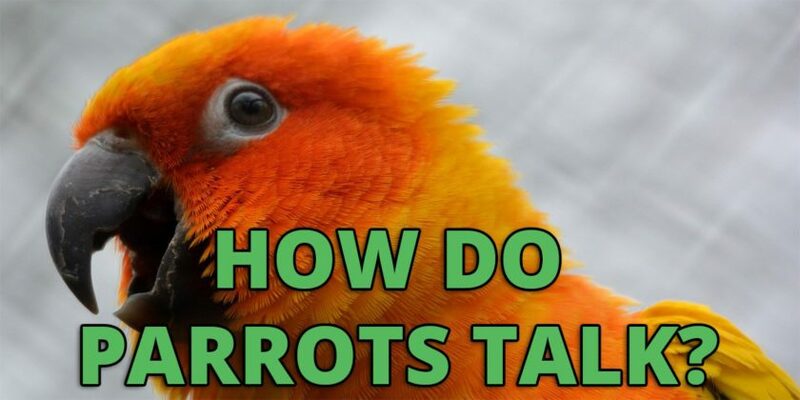 Parrots are vocal learners. They share this trait with humans and a few other bird species such as crows, ravens, and Mynah birds. According to Ashley P. Taylor on the Audubon website, this means they grasp sounds by hearing and then imitating them. 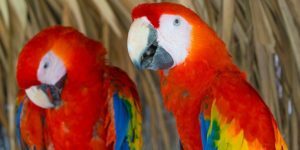 Parrots are the best of the avian vocal learners for a reason. Part of a bird’s brain, known as the “song system”, is devoted to vocal learning. 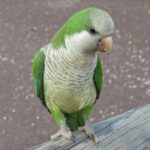 A study by Duke University’s Erich Jarvis that looked at why can parrots talk shows us that parrots have an extra layer of their brain devoted to this task, explaining their vocal expertise. In the wild, parrots use their vocal skill to impart important information to their flock mates. Their ability to communicate help keep them safe from predators while foraging as some can be on the lookout for trouble. They are one of the few animals that have developed complex vocal communication. Studies of wild parrots have indicated that the chicks learn their first calls from their parents, rather than drawing on instinct. Parrot parents seem to name their chicks as well, with the name lasting for the bird’s lifetime. This shows intelligence as well as the ability to create and repeat numerous, specific calls. Pet parrots imitate human speech so they can integrate into the flock. They are very social creatures and want to fit in with the family. Kept as pets, they have the time and the mental ability to carry it off. They are especially prone to mimicking the sounds and words associated with excited behavior. 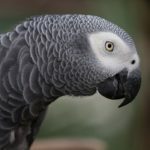 Parrots can mimic human speech despite not having the lips, teeth, vocal cords and palate that of their wingless tutors. They manage this by using their syrinx, a vocal organ located in the bird’s breast. Deb White at the parrot fun zone website explains how it works. The syrinx is a muscular, wishbone-shaped organ found where the trachea meets the lungs. Parrots can control the syrinx’s two valves independently, enabling them to produce two distinct tones simultaneously. They manipulate the shape and depth of the syrinx to produce different sounds. Among the many species of parrots, there are some that are better than other at mimicking human speech. Some have better memories and can have vocabularies of hundreds of words. We will look at the some of the best talkers as determined by the PetMD website. Budgerigars also known as budgies or parakeets – Their voice is low and not particularly well-defined, but they can be trained to learn a large number of words. Monk parakeet or Quaker parrot – Clever, social capable of vocabularies of words and phrases. Blue-Fronted Amazon – A long-lived bird with an excellent speaking voice and ability to mimic human voices. Indian Ringneck – Clever birds who will repeat human words and sentences in their own bird voices. Senegal Parrot – Common across Africa, these birds have high pitched screeches and the ability to mimic. Eclectus parrot – These birds need to be trained at an early age in order to become vocal. They can then mimic the tone and mood of language. Yellow-Crowned Amazon – Is excellent at mimicking human speech. 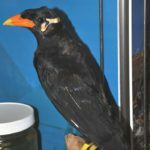 Hill Myna – A small bird that can vary its pitch and tonality as it mimics human voices. 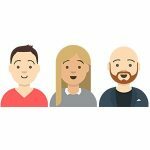 It should be noted that as with all species of animals, including humans, individuals will have varying personalities that may affect their predilection to talk. Though the species mentioned above are known for being good talkers in general, some parrots are just shy or quiet and no amount of training will change that fact. 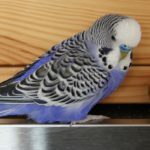 We have an entire article dedicated to non-noisey birds and they can be a great choice for owners that don’t want to put up with a lot of sound. 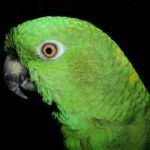 Ron Hines, DVM, provides an in-depth guide to teaching parrots to talk. Obviously, one of the most important decisions is to choose a parrot species that has the potential to mimic speech. It is also beneficial to start teaching the birds at a young age if possible. 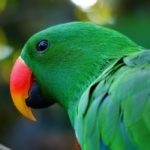 For Eclectus parrots, it is critical to start when they are young or their capacity for speech is drastically reduced. Shy, fearful birds are harder to train. You want a parrot that relates well to you in a relaxed, trusting way. It is easier to train a single bird rather than a pair or group as this limits distractions. Here is a video regarding the training of parakeets to talk. Your parrot is never too young to be talked to, and it will remember words at very young ages. Smaller parrots will start repeating words at around 3-6 months and larger parrots at 6-12 months old. These first attempts will likely be hard to identify as words. 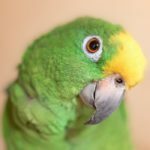 Two keys to teaching your parrot to talk are patience and repetition. You should create a quiet environment, free from distractions such as a radio or television. 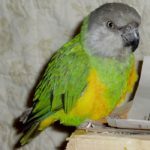 Your parrot will key in on the excitement in your voice and they tend to learn faster when they can associate a word with an object or action. You should pick a regular time to perform speech training. Parrots are usually more attentive in the morning and evening, so aim for those times. As your bird succeeds in its learning, reinforcement with treats are recommended. You may find your bird talks more when you are out of sight. Parrots hate to be alone and like to maintain vocal contact with their flock or mates, be they feathered or not. Based on the species of parrot you are training, you can be in for a long and enjoyable process. 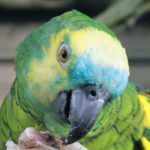 Your parrot will tend to favor words it hears repeated in an excited or emotional manner. This explains the preponderance of videos featuring parrots cursing. Be careful what you say or you may hear it all the time!